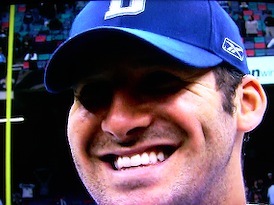 Romo is all smiles after big win; Galloway chokes on cigar. The Cowboys' delicious win over previously unbeaten New Orleans amounts to one big doody sandwich for a certain loud-mouthed and reliably wrong prognosticator. 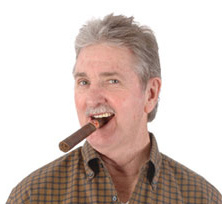 Maybe you think I'm being a little harsh on Randy Galloway. No, not at all. He fully deserves it. No one in the wide world of D-FW sportscasting talks more trash than the sanctimonious, sarcastic grandpappy from Grand Prairie. So back atcha. On Friday afternoon's edition of Galloway & Company (103.3 FM), the host semi-facetiously and repeatedly predicted a 100 to 3 Saints win. He of course also spent ample time ridiculing Dallas head coach Wade Phillips, whom he wants fired. Galloway lamented that Saints' coach Sean Payton, a former Cowboys assistant, had been allowed to get away. At times he seemed all too willing to eat the peanuts out of Payton's excrement. "Doofus" Phillips clearly would have no chance Saturday night against such a mastermind. Commercial breaks on Galloway & Company were bridged with various celebratory Saints' songs. The host of course was "keeping it real" while one of his sidekicks, Ian Fitzsimmons, had the temerity to say that Dallas at least had a chance against New Orleans. We'll see what the old Cuervo-slurping character assassin comes up with on Monday's show. Probably a lot of excuses as to why Dallas won 24-17 but should have been routed. And how they prevailed despite Phillips. Meanwhile, as previously noted, Galloway's long-running circus act continues to get pounded in the ratings by "The Ticket's" competing Hardline show. So shouldn't he be the one to get sacked? In light of the way he hammers away at Phillips, that's a very fair question. Now more than ever.